Today was J’s first time on the ice. She had been looking forward to it for a while. Yesterday her teacher prepared the Grade One class for the event, with words of encouragement. For some, this would be their first time too. For others, it was a breeze – some of these kids have played hockey for one or two seasons already. Luckily, J was excited not anxious. We had all the requisite paraphernalia, thanks to a loan from some good friends, so she was kitted out with skates, a helmet and a “Skate Buddy”, a kind of zimmerframe for new skaters. All the kids in Grades One through Three were bused to the Iroquois Sports Centre, and T, S and I walked down to join them and waved madly as the yellow school buses passed us on the way! Oh, the excitement! We went inside the complex and were immediately enveloped in warmth and enticing food smells (there’s a PizzaPizza outlet). Dragging a distracted T past the video-games, we made our way through the huge foyer, going with the flow of chattering children, scanning the throng for J. Entering an ice arena, we found a mad scramble of kids donning kit and parents trying to keep track of belongings. Ice pads 3 and 4 were at the disposal of the school, and were split between the older and younger kids. The air was crisp, the ice shiny. We found a spot by one of the gates where our view wasn’t obscured by the plexiglass shield. T stood on the bench to get a good view and I leaned on the wall of the rink. The cone was cool for a while, (they call them pylons here, incidentally) but did not lend itself easily to movement and maneuverability. After a few slips and spills that put me in mind of that bit in the film Bambi, all skinny legs at funny angles, I suggested to J it was time to graduate to the Skate Buddy. She was reluctant at first, but once she realised a few other kids had one too, she agreed. Now she was able to make some headway. Fewer slips and a circuit of the rink later she was looking flushed and happy. Children whizzed by at high speed, like mosquitos, they were small, fast and could change direction like I change my mind, instantly and often. Others were content to join the masses in the huge swathe of counter-clockwise-moving bodies. Some hugged the sides, others made their own kind of progress. There were a few body slides, mainly boys, demonstrating their hockey derived ice dexterity. Parents were out skating with their kids, one mum was skating with a pushchair. Everyone looked happy. Here were Canadians in their element, doing what they love, doing what they get up at 6am on weekends for! 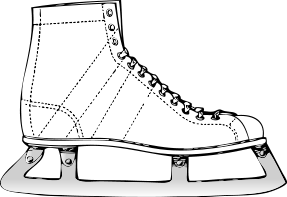 J continued lapping the rink, chatting with friends, and laughing at the antics of others, and that’s where we had to leave her, because, as S noisily pointed out – it ‘ain’t no fun when you’re stuck in a pushchair!